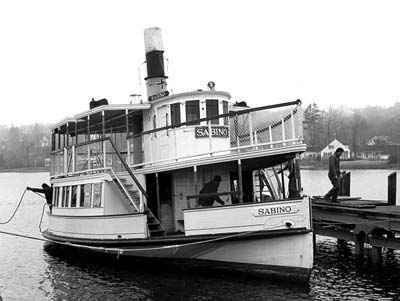 Presented is the coastal steamer SABINO, that was launched from the W. Irving Adams shipyard in East Boothbay, Maine in 1908. She will celebrate her 100th birthday next year. Originally named TOURIST, she was reamed in 1921. Most of he life was spent running the Damariscotta, Kebbebec rivers and Casco Bay. Over the years modifications were made to her hull with the fitting of sponsons for added stability, deck and pilot house, all to increase safety and passenger comfort. Her configuration today is as it was in 1927. She would be perfectly recognizable to those who knew her in service on the Damariscotta River in the early years of this century. The adoption of steam for small passenger and cargo carrying vessels in the United States occurred in the first decade of the 19th Century. Steam passenger and cargo vessels dominated the American Excursion Fleet. 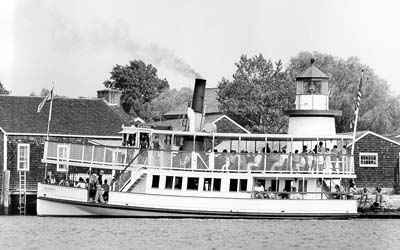 One of two surviving members of the unlicensed steamers that flitted around like mosquitoes on the inland waters of the United States, SABINO is the sole survivor of these small excursion steamers built on the Atlantic Coast. The other survivor, Virginia V, is the sole Pacific Coast-built small excursion steamer. These two vessels alone represent a fleet that in June 1932 was numbered an astounding 260,983 documented vessels. The fact of their survival, and a contributing factor in their significance, is the fact that both continue in operation, keeping alive a tradition of a now vanished technology. MODEL'S CONSTRUCTION: She is built using new procedures and materials to replicate in the tiniest detail all the things that make up an accurate recreation of this outstanding quality. These include a properly formed hull finished in multiple coats of hand rubbed enamel and varnished brightwork. The screened rails, wood benches, accurate standing rigging, tall stack, shielded running lights, and all sorts of deck hardware and fittings are accurate to the last detail. SABINO makes an incomparable model and will be a perfect addition to your home, den or office. All MODELS are NOT CREATED EQUAL. There is no comparison to our replicas at near this price. Before you buy, make sure to look at all photographs carefully. Ours will show a model of unparalleled quality and faithfulness to the original builder's plans. Give-always are the rake of the masts, fit of the sails, the proportions of the hull, and the cut of the bow. If you're in doubt, email us! Claire White-Peterson photo courtesy of Mystic Seaport. L/B/D: 57' 1" × 22' 3" × 6' 4"
OUR UNCONDITIONAL “NO NONSENSE“ GUARANTEE: If not completely satisfied with your purchase it may be returned, if without damage, within three days of receipt in its original condition and packaging. Returns must be insured for their full value. All that is required is a prior email authorization by us for the return. Unfortunately, no refund can be made for the cost of shipping, packaging and handling unless we are at fault.